HomeBlogWhat I Learned About Marketing From the Scottsdale Arabian Horse Show. A few days ago I paid a special visit to a very unique horse show. The whole “Valley of the Sun” has been abuzz with excitement around the Scottsdale Arabian Horse Show. It’s a recurring fixture in my area… and a fun event to boot. Tens of thousands of people show up every day to see the most beautiful horses from around the world. And, when I mean from “around the world,” I mean from Around the world! Some of these horses are flown from Europe and the Middle East just to attend this event! Along with these amazing horses… some of the most talented riders in the world show off their abilities. If you’ve never been, let me tell you, it’s a horse lovers dream. I was able to score free tickets (Thanks Taryl! )… and I’ve got to tell you I learned something amazing about marketing. 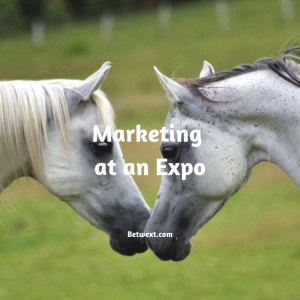 Strange right… who learns about marketing at a horse show? I do! One of the big observations I made was this… Some do marketing the right way, and others do it wrong. At this event people are here for two things… to see the horses… and to shop. Seriously, shopping is a competitive event! The Expo portion of the horse show is massive. It’s isle after isle of booths selling everything from jewelry to real estate. You’ll find clothing of all sizes, hats, boots, home goods… I even saw investment advisors hawking bonds. Everyone entering the horse show enters into the great hall, where the booths are set up. And an opportunity to connect with hoards of interested buyers. This is where you find some doing it “Right” and others… well, not so much. One company was taking full advantage of the event. Now, I’m not going to tell you what they were selling… because I don’t want to encourage competition. But I will tell you this, they are a Betwext customer! So, of course, I walked up and asked them how the event was going. They were blowing it out of the water. We only had a few seconds before another customer showed up and made a purchase. They told everyone who walked by they could win free product… all they had to do was text to win! The company would select a lucky winner from all the people who joined their texting list over the course of the Expo. Now this was interesting… many of the people who joined their texting list WERE NOT buyers. They were people who maybe didn’t want to approach the booth… or thought they were too busy with other customers. Every day they added dozens of new prospects to their marketing list – all from a simple banner and a great offer. Since the event, they announced the winner. Then, they sent out a special offer just to the group of Expo goers… and that drove even more orders! They continue to send out a number of messages… and have racked up thousands of dollars in orders… all from gathering names by text! Like I said, some people do marketing the right way! If you’re planning on attending a conference, an expo, an industry association meeting… anything where you’ll have a booth… I highly recommend you collect contact info by text message. There are four simple steps to make this really work well. First pick a good keyword and a great offer. Keep the keyword short and easy to spell… like WIN, or MONEY, or GAME, or DEMO… just to name a few options. Then combine that with an irresistible offer – give prospects free product, or the chance to win a free one month supply. I’ve seen some people give away free consultations… or gift cards… or even a free report. Heck, I know one guy who gave away a link to a video of him talking at a different conference! I know one group who offered a free BBQ lunch to everyone who texted in and joined the list. The organization texted back with the location of the free lunch! Once you have those put together – a GREAT keyword and a GREAT offer – your next step is simple. Have a big banner made… ask people to text in. Have business cards printed, but instead of your info… ask people to text in. Have flyers printed… and ask people to text in. Post it to your social media accounts and post it to Facebook, Instagram and Twitter! Everytime you speak with someone, ask them to text to sing-up and text in. For step three, You need to plan your immediate follow-up. Start that relationship off on the right foot! Finally we get to step four… figure out your long term follow-up. This does not need to be complicated… Make sure you follow-up with your offer. If you are giving something away – announce the winner. Make sure your prospects get what they requested. Before long you’ll have a hoard of dedicated prospects from the conference! Trust me, follow these simple steps and you’ll be getting AMAZING results from your next conference, expo, or association meeting. The Ultimate Guide to Text Message Marketing. We cover everything you need to know, soup to nuts!